The use of biomaterial as fuel is one method to reduce our reliance on fossil fuels. Conversion of biomaterial into biodiesel produces fatty acid methyl esters (FAME) which can be blended with diesel. However, at high concentrations FAME can damage engines, particularly older models. 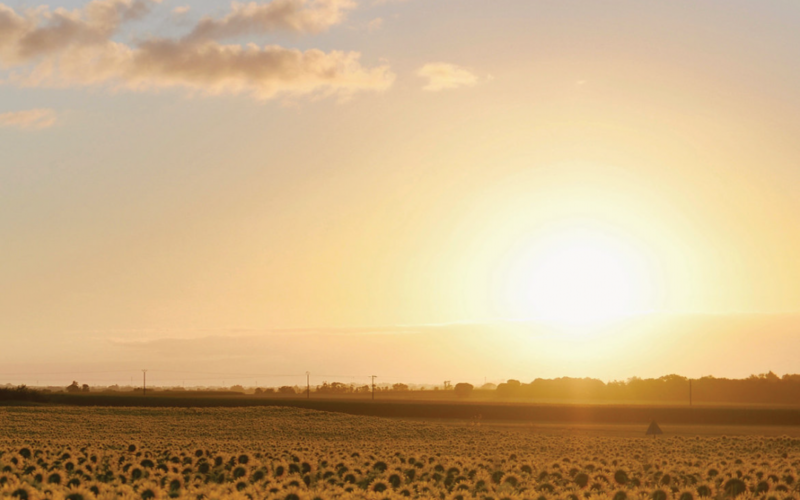 As a result, biofuels are highly regulated with limits set to prevent damage. In the UK FAME content is limited to 7%, with similar limits in other territories. 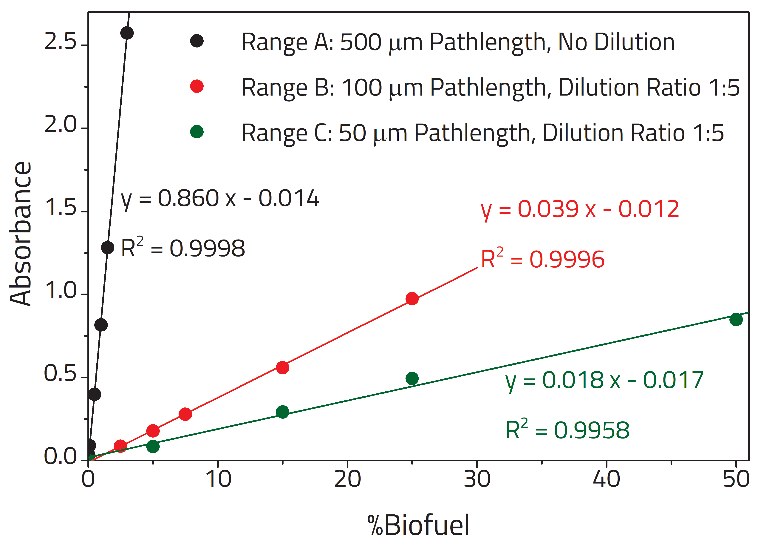 Accurate methods for the determination of FAME content of fuels are essential. This note shows how the Pearl and Oyster system is ideally suited to the determination of FAME content using EN 14078, an internationally recognised standard. 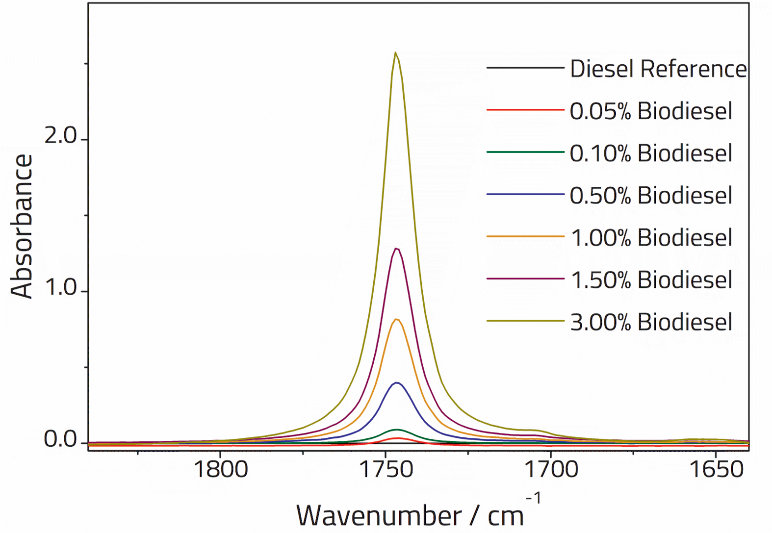 Calibration standards of known FAME content were obtained from Peter Cremer Nexsol Biodiesel. The EN 14078 standard sets out three different ranges for FAME content at different concentrations, with longer pathlengths required for more dilute samples. Spectra were recorded in Oyster cells with pathlengths of 50, 100 and 500 µm fitted in the Pearl accessory on a commercially available spectrometer. For the calibration plots an appropriate base fuel was used as a background. 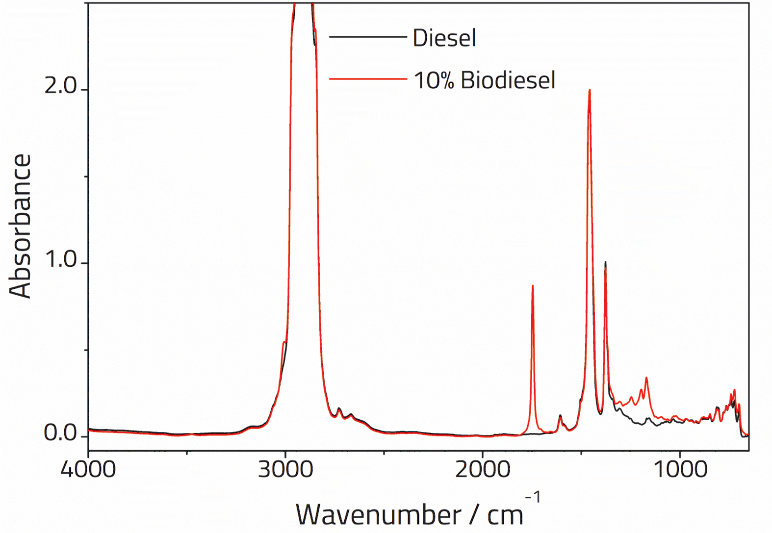 The IR spectra of mineral diesel and biodiesel are shown in Figure1. The band at 1747 cm-1 is assigned to the C=O stretch in FAME and is completely absent in the case of mineral diesel. Figure 2 shows spectra recorded in a 500µm pathlength cell in the CO region. As expected the carbonyl band increases with increasing FAME content with the calibration plot shown in Figure 3. Also shown are calibration plots obtained for cells with pathlengths at 50 and 100 µm, using higher FAME contents. In all cases extremely high R2 values were obtained demonstrating a good fit to the data. The calibration will vary depending on the raw material used and therefore the calibration should be constructed using standards closely matched to the unknown sample material. Since the exact pathlength will vary cell to cell it is advisable to recalculate the calibration graph whenever the Oyster cell is changed or use the exact pathlength to correct for changes. for the 3 different ranges specified by EN 14078. These results clearly show that the Specac Pearl and Oyster system can be used to obtain calibration plots for FAME content in accordance with EN 14078. The use of a parallel Oyster cell allows the determination of the exact pathlength as required by the standard using the fringing method. 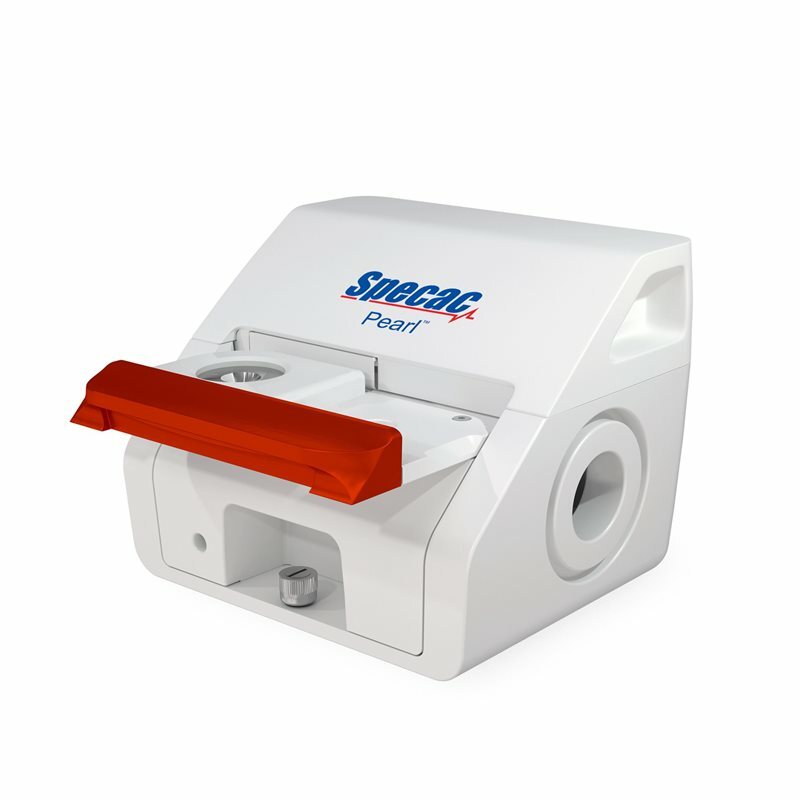 The system has several advantages over the traditional liquid cell assembly used for FAME content determination: The Oyster cell is engineered for rapid sample screening and easy cleaning ensuring a high sample throughput. Unlike a traditional cell, that cannot be disassembled without altering the pathlength, the Oyster is designed to consistently form the same pathlength. This greatly simplifies cleaning, ensuring that errors due to incomplete cleaning are less likely to creep into your dataset. Traditional cell designs suffer from the possibility of leakage which is disastrous; once the cell leaks it must be dismantled, cleaned and reassembled followed by laborious recalibration. With the Oyster cells horizontal design the possibility of cell leakage is greatly reduced and so downtime for recalibration is minimised.